Toys and foot toys geared toward medium-sized birds, such as larger conures, pionus, caiques, eclectus, greys, smaller cockatoos and mini-macaws. Please click the pictures of each item for a better view and additional information. Great for smaller birds who love to shred (yes - it's not too large for a cockatiel!) to medium birds. Chock full of crinkle paper plus finger traps that are stuffed with dried pineapple and paper, plus a fun natural root! Make it a foraging toy by adding some non-perishable treats! A 3 inch rattan ball filled with pasta (and what bird ISN'T part Italian?)! Decorated with links and pacifiers and can be hung or used as a foot toy! Assorted colors of our choice. It's back! Three green vine balls, accented with heart and star rings, make this a great chewing toy for any plucker or over-preener. Hand crafted in the USA . Dimensions: 11" x 4" x 4" Recommended for medium birds, such a galahs, greys, eclectus, goffins, severes and similarly sized birds. It's back! A fun and festive toy for your feathered friend! Hand crafted in the USA. Wooden blocks and plastic stars hung on a skewer to make this a great holiday tree for your bird's cage. Dimensions: 10" x 5" x 5" Recommended for medium birds, such a galahs, greys, eclectus, goffins, severes and similarly sized birds. Stuff with non-perishable treats or crinkle paper! Hang from plastic chain. Tons of possibilities! Not recommended for big beaks, such as macaws or cockatoos, without supervision as they can easily break these. Colored Plastic Wiffle Balls 3 1/4"
A huge rattan ball stuffed with crinkle paper, strung on hemp rope and decorated with acrylic balls and disks. Lots of room to hide treats to make it a fabulous foraging toy! Recommended for small birds, such caiques, pionus, conures and similarly sized birds, to medium birds who are less aggressive chewers, such as greys, eclectus, goffins, etc. Hung with a bird-safe plastic link. Toy hangs 9" in total. Actual toy is 3" x 3" x 5"
Proudly made in the USA by What the Flock bird toys. A huge rattan ball stuffed with crinkle paper, strung on hemp rope and decorated with acrylic balls and disks. Lots of room to hide treats to make it a fabulous foraging toy! Recommended for medium birds, such as greys, eclectus, goffins, etc. and larger birds who are less agressive chewers. Hung with a bird-safe plastic link. Toy hangs 11" in total. Actual toy is 5" x 5" x 8"
BEST BUY! A nutritious supplement and weaning food for all exotics with no artificial colors or flavors and no synthetic vitamins. A blend of dehydrated fruits, vegetables and calming herbs. The flowers of Hibiscus and Chamomile flowers have been used for their calming and relaxing properties. Can be served dry or moistened. Click HERE for rehydrating directions and ingredients. What bird doesn't like sneakers? Great for little birds or medium birds with less agressive chewing tendencies. Super for learning foraging! Hide some treats inside the sneaker when the crinkle paper is gone, or refill with more paper! Great for little birds or less agressive medium birds. Super for learning foraging! Hide some treats inside the shoe when the crinkle paper is gone, or refill with more paper! Simple, but fun! Make it a foraging toy and hide nuts inside. A cluster of fingertraps easily held by medium sized birds and great for hanging or "playground" toys for smaller birds! Keep those pluckers and overpreeners happy while they preen these feathers and not their own! The perfect feather preening toy for all preeners, pickers & pluckers! A large hardwood cap, stuffed full of pre-sanitized feathers that are threaded with colorful pony beads. Comes with a bird-safe link adorned with little pacifiers and a star! Your bird will love removing the beads and this toy might just become his best friend! This toy is made of kraft paper. Inside is fill with crinkle paper. 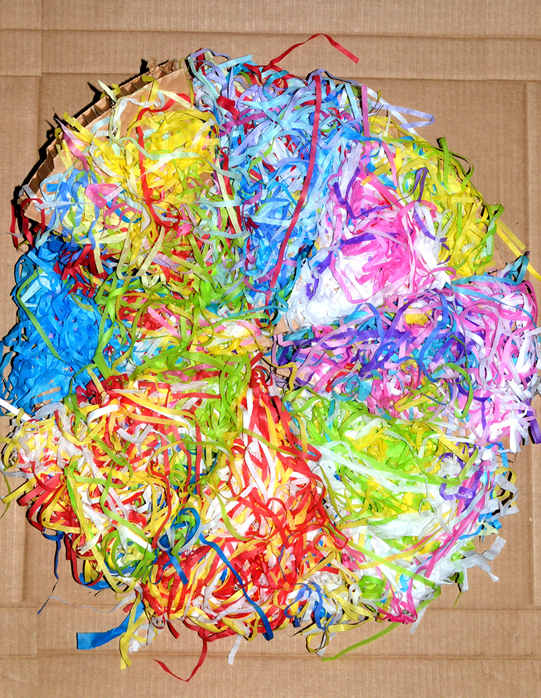 This 28" (total length) toy has a cardboard box full of crinkle paper between slices of cardboard with wood shapes all strung together with paper rope. Make it a foraging toy and hide treats inside! Every birdie needs a blankie to snuggle up against. As your bird scoots up against it, the blanket will drape over him offering some warm cozy comfort. Just clip it above your birds favorite sleep perch. Colors will vary. A center plastic link chain has lots of notched wood slices and plastic beads on either side. Your bird will love to use their beaks and feet to manipulate this toy! Recommended for conures, caiques, ringnecks, quakers, pionus and similarly sized birds and less aggressive chewers in the medium species, such as greys and eclectus and similarly sized birds. Five strands of wood polyrope attached to a large wooden ball provides tons of chewing and enrichment! Recommended for conures, caiques, ringnecks, quakers, pionus and similarly sized birds or less agressive chewers of the medium species such as Eclectus, Greys, etc. Game on! The Kick Ball bird toy is sure to provide tons of` action for your high energy bird. Stuff some non-perishable treats in the sneaker to make it a foraging toy. Approximate Dimensions: 12" x 4" x 4"
Approximate Dimensions: 15" x 4.5" x 4"
Happy Beaks double rattle bird toy has multi-colored acrylic balls with a jingle ball in the center of each one. Happy Beaks medium vine foraging balls bird toy features a cluster of vibrantly colored vine balls and colord vine chain and is perfect for birds that love chewing, and that love to preen. Large Apple by Happy Beaks features an array of colorful wood blocks and beads hung on a stainless steel chain, accompiened by small wifflw balls and stainless steel bells at the bottom. Medium cluster of hanging balls bird toy features a wooden block hung on metal chain with loads of large multo-colored wooden beads strung on knotted leather strips. Sisal rope is added for preening fun. Happy Beaks medium hanging fleece bird swing is great for birds who love to preen, and also great for pluckers. This bird swing has ruffled fleece sides with acrylic gems at the bottom. Happy Beaks large hanging fleece bird swing is great for birds who love to preen, and also great for pluckers. This bird swing has ruffled fleece sides with acrylic gems at the bottom. The Pizza Party toy features 8 big slices of food grade cardboard pizza covered in food grade shredded paper. All materials are non-toxic and completely bird safe. One slice has Stainless Steel chain and Stainless Steel quick link for hanging. Once your bird destroys the slice, simply put the chain and link on a refill slice (7 included) and let the fun continue. The pizza party is an affordable toy that you’ll enjoy watching your bird spend hours destroying knowing you didn’t spend a fortune! Each individual slice measures 9" at the top and is 11" long! Great for smaller to medium birds, from conures, pionus, hahns macaws, etc. to less aggressive greys, eclectus, cockatoos and similarly sized birds. Happy Beaks Large Pencil is a great hanging talon toy. Made of soft pine, it is easy for chewing but must be "held", thereby providing more enchrichment and avoiding the perch parrot syndrome! Recommended for Recommended for medium to large birds such as Greys, Galahs, Small Cockatoos, etc. Macaws, Cockatoos and other similarly sized birds. Happy Beaks Small Pencil is a great hanging talon toy. Made of soft pine, it is easy for chewing but must be "held", thereby providing more enchrichment and avoiding the perch parrot syndrome! Recommended for smaller birds such as Caiques, Conures, Pionus, Hahns Macaws, and other similarly sized birds. Happy Beaks Foraging Tube is a colorful and textured mix of wooden blocks, plastic gears, leather strips, and beads and a large paper core bagel delight heavy chewers and tough beaks. Hide non-perishable food and treats inside for more enrichment! Recommended for small to medium birds such as Caiques, Pionus, Hahns Macaws, Greys, Galahs, Small Cockatoos, etc. to less aggressive larger birds, such as Macaws, Cockatoos and other similarly sized birds. Happy Beaks dream catcher bird toy is a colorful and textured mix of wooden blocks, plastic gears, leather strips, and beads and a large paper core bagel delight heavy chewers and tough beaks. Recommended for medium to large birds such as Greys, Galahs, Small Cockatoos, etc. Macaws, Cockatoos and other similarly sized birds. Great foraging birds who love to shred! Made of natural burlap and stuffed full of crinkled paper, this toy offers your bird an excellent foraging experience. Your bird will love working to uncover the fun inside this bag! Recommended for small birds, such as caiques, pionus, hahns macaws, quakers, etc. to medium birds, such as eclectus, goffins, galahs, etc. to less aggressive larger birds. Great foraging birds who love to shred! Made of natural burlap and stuffed full of crinkled paper, this toy offers your bird an excellent foraging experience. Your bird will love working to uncover the fun inside this bag! Recommended for medium birds, such as eclectus, goffins, galahs, etc. to less aggressive larger birds. Great foraging toy! The Chop-Choppy bird toy has natural sisal rope, 100% cotton rope, natural pieces of wood, various acrylic pieces and vegetable leather parts & strips all hung on chain. Make this a foraging toy and hide non-perishable treats inside! Recommended for smaller birds, such as caiques, conures, pionus, etc. to medium birds, such as eclectus, goffins, galahs, etc. Recommended for smaller birds, such as pionus, caiques, larger conures, quakers, ringnecks, etc. to less aggressive medium birds, such as goffins, greys, eclectus, smaller macaws, galahs, etc. The new Fireball is a great toy for your bird. Many wood pieces to have fun with. You can hide a treat inside the paper rope. Mounted on a chain this and made of 25 feet of paper rope and 60 wood pieces. Recommended for medium birds, such as goffins, greys, eclectus, smaller macaws, galahs, etc. Recommended for medium birds, such as goffins, greys, galahs, etc. to less aggressive larger birds. The new Fireball is a great toy for your bird. Many wood pieces to have fun with. You can hide a treat inside the paper rope. Mounted on a chain this and made of 62 feet of paper rope and 120 wood pieces. Recommended for more aggressive medium birds, such as goffins, greys, galahs, etc. to less aggressive larger birds. Change your bird's "perch-spective"! Unique vertical and horizontal swinging perch that can be hung anywhere inside your bird's cage or in your pet bird's out-of-cage play area! In the wild, birds climb from branch to branch, using energy and movement. S-shaped perch swing is made from durable, fluted FDA-approved PVC, wood, and paper rope. Paper rope can be replaced. The Space Shuttle is a great option for parrots who tend to overpreen, feather worriers or pluckers. Lots of texture and movement in this toy. Coconut chunks, colorful corn cobs, shells, a huge woven ball and corn husks provide foraging and enrichment! Great for pluckers and overpreeners. Recommended for medium birds, such as eclectus, greys, galahs, etc. The Gypsy Queen is another great option for parrots who tend to overpreen, feather worriers or pluckers. Lots of texture and movement in this toy. Coconut chunks, colorful corn cobs, shells, woven palm balls and stars provide foraging and enrichment! Oyster shells are tied between natural pods which are then adorned with even more palm shreds plus a braided ball on the bottom for durability. Recommended for small birds, such as conures, caiques, pionus, tiels, etc. to less destructive medium birds,such as eclectus, greys, etc. The Gypsy Queen is another great option for parrots who tend to overpreen, feather worriers or pluckers. Lots of texture and movement in this toy. Coconut chunks, colorful corn cobs, shells, woven palm balls and stars provide foraging and enrichment! Oyster shells are tied between natural pods which are then adorned with even more palm shreds plus a braided ball on the bottom for durability. Recommended for medium birds, such as eclectus, greys, galahs, etc. Recommended for Small to Medium Sized birds, from caiques, conures, pionus, etc. to eclectus, galahs, etc. These interlocking rings of all natural fibers woven for super crunchy appeal are great for birds that love texture. Smaller birds can sit in the rings and medium sized birds can swing as they chew. Catch of The Day is the perfect healthy accessory for your medium and less destructive larger feathered family member. Let your bird preen strands of palm leaf and abaca fiber from this exciting shredder of a toy. While also providing a safe, healthy outlet for instinctual shredding behavior. Toy measures approximately 15 inches high and approximately 5 inches wide with a fiber loop for hanging purposes. Great for small to medium birds, such as caiques, larger conures, pionus, greys, eclectus, galahs and similarly sized birds. Colorful and safe Cotton Rope woven into a large "Pony Tail" style bundle and anchored together with a stainless steel ring, and hung by bird safe stainless steel quick link. Hours of shredding chewing fun.